This unique 3-piece top allows adjustable-hole openings. 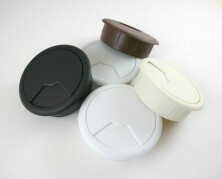 The wire grommet is offered in three different sizes and several different color options. 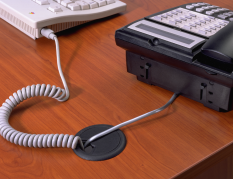 Ideal for workspaces with computers and various electronics, this grommet can easily handle multiple data, power, and peripheral cables, as well as phone, fax, and coaxial lines. 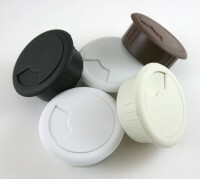 The 50mm Wire Grommet is ideal for smaller spaces with a single computer, whereas the 60mm and 80mm Wire Grommet is ideal for multiple computers and electronics. The adjustable top allows cables to be fed through from any direction while the size of the opening can be adjusted to free up more space or tighten to secure the cables.